This post is to answer some questions I have received about the OBE Binaural Beat Audio that is located in my Products Page. This audio contains no subliminal. As far as the brainwaves, I start it off in Beta then have it gradually descend into Delta. This decent takes ten minutes and then for forty minutes it’s pure upper Delta. The last ten minutes I have it ascend back to Beta. So the first ten minutes it descends into Delta and the last ten minutes ascends back to Beta which means you will have a forty minute window for your Out of Body Experiences. Now, one of the greatest tips that I can give you is that you should focus your attention on the wavering sound which is the Phantom beat that you can only “HEAR” when both halves of the brain work in unison. The second you start to hear the phantom beat the brain begins to physically create NEW neural pathways that increase the communication between both halves of the brain and produce Whole Brain Thinking. The more you listen to this audio the more your brain will physically change, giving you the ability for not only Out of Body Experiences, but for all type of Psychic Phenomenon. To get a good handle on what the Phantom Binaural Beat sounds like, just remove one ear plug while listening to the audio and you should just hear one steady tone. When you put the earplug back in you should be able to detect the beat. I hope you enjoy this audio. Posted in Meditation, Science and Metaphysics by Louis Ruiz with 3 comments. There are many tools to determine the states of consciousness a person may be in. One of those tools is an electroencephalogram or EEG for short. It measures brain activity in Hertz or frequencies (cycles per second). There are many frequency ranges but four main ones. These are called Beta, Alpha, Theta and delta. Here are the four frequency ranges. The 4 Building Blocks of Consciousness from highest frequencies or brain activity to the lowest. We generally produce all brainwave frequencies at the same time but the dominant frequency determines the Brainwave State. For example: 70 percent Beta, 10 percent Alpha, 10 percent Theta and 10 Delta will put you in a Beta Brainwave State. Research has shown that we are in different states of mind depending on which Brainwave State we are in. Each Brainwave State has its own characteristics that is unique to itself. Beta includes our normal everyday level of consciousness where we are alert and active. Of the four main Brainwave States, this one has the highest level of brain activity. As we reduce our level of brain activity, such as watching TV, relaxing or with our eyes closed, we enter an Alpha Brainwave State. If you relax further, your brain activity is reduced even more. When you begin to experience drowsiness and spontaneous Images or Dreams sequences, you have entered Theta. Reducing Your brain activity even further, you will now enter Delta. Delta or deep sleep, has been described as a mini death, it goes to the very edge of no brain activity (death). Each of these Brain Wave States is a gateway to various experiences. In Beta and Alpha we have access to our normal everyday physical reality and all the abilities therein. Beta and Alpha, belong to what various sciences call consciousness (The Waking Mind). In Theta we have access to other abilities. These include, telepathy, dreams, Out of Body Experiences while entering the dream world or what Carl Jung called The Collective Unconscious, thought world(s), Telekinesis, remote viewing and any other of the psychic abilities. In the Delta Gateway, we have access to such experiences as Out of Body experiences into the Etheric Plane (a frequency range within the Space-Time Continuum) and other Planes of existence. Science calls Theta and Delta, part of the subconscious. You can accurately call these Brainwave States a continuum of consciousness, from greater brain activity to lesser brain activity. Just like you can tune into different radio stations (Frequencies) on a radio, you can also tune into different frequencies of The Consciousness Continuum. There are many ways to learn to control your brainwave frequencies. Some include but not limited to: rhythmic beats matching the frequency of the desired brain state, Meditation, Binaural Beat Technologies, breathing techniques, mantra chanting, visualizations and many others. The Holy Grail of all Metaphysical Arts is the ability to control your brainwave states at will. I will illustrate with a small story excerpted from my upcoming book. Louis heads an IT (Information Technology) Department and is at work enjoying a work related discussion with some co workers (He is in a Beta Brainwave State). During the conversation he experiences a brief flash of drowsiness (Theta burst). From past experience, he recognizes this as someone trying to reach him telepathically. He excuses himself and heads into his office. He closes the door and sits in his chair. He closes his his eyes, takes a few deep breathes and then begins to relax (He almost immediately enters the Alpha State as his brain activity drops). He knows he needs to enter Theta to tune into The Mental Band. This is the main method of communication between beings from all areas of Reality, both physical and nonphysical. This has been called many names through out the ages (The Collective Unconscious, The DreamScape as examples). 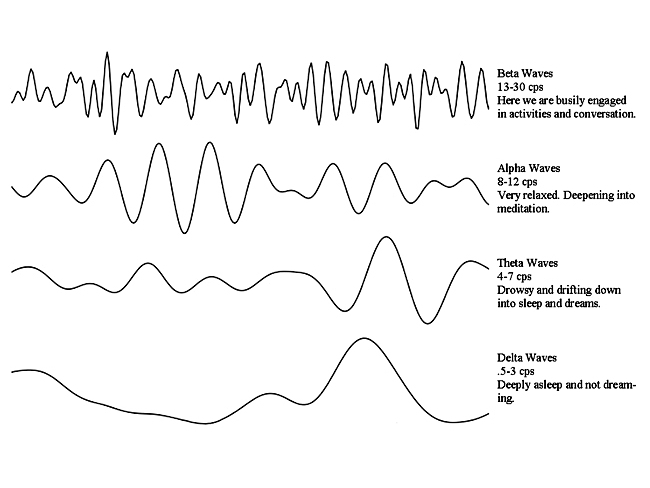 In this relaxed (Alpha) state he searches for what he calls The Sleep Signal (The sensation of being sleepy or drowsy). He finds it and places his attention on it (Tuning in). Slowly the sleepiness begins to increase and images begin to flash spontaneously. He is entering Theta and continues to leave his attention on The Sleep Signal. As the drowsiness begins to envelop (entering into deeper Theta) him, The flashes become sequences that last longer. His head drops as he is completely enveloped in the Theta brainwave State. From here, he hears it clearly, a telepathic cry for help. Someone is in trouble. He “looks” in the direction of the mental cry and instantly is next to a small girl crying. He is now out of his body inside of the thought world (Still in Theta Range). “Who are you?” she asks. “I am a friend. why are you crying?” he asks. “I was playing in my backyard and fell into the pond. I can’t swim and could not breathe. I know that I am dead because I am here in nothingness. I was told that when you die that you just go into nothingness.” She says. “Actually, you are in a section of reality that responds to your thoughts. This place is created by you and you can exit any time you want.” he says. “How do I do that?” she asks. “Well, right now you are somewhere else with your eyes closed. All you have to do is open them. Try it now.” He tells her. After a few moments of her trying to open her eyes she says “I can’t can you please help me?” He responds “OK, I will disappear for a moment but you will see me again when you wake up”. He focuses his attention on his physical body which is slumped in his office chair. He is now back and knows he must enter the Delta brainwave state to help the girl. He “Lets Go” further and now enters Delta. He rolls out of his physical body to enter his Etheric Body. He is now out of body in a different section of The Greater Reality. Standing next to his body, he focuses on the girl and begins to feel pulled in her direction. It almost feels as if he is falling in her direction as opposed to flying. Soon he is next to a pond. He dives in and finds her physical body. Close by, floating with her eyes closed is her Etheric Body. He begins to shake her Etheric Body as you would anyone you are trying to wake up. She opens her eyes slowly and begins to cry in gratitude as she recognizes him. Suddenly he momentarily feels his body in the office chair. He recognizes that it is calling him back for some reason. “Listen, go into your house and stay close to your parents. I will be back soon to check up on you.” He tells her. “Thank you so much. I will wait for you.” She says. He focuses on his physical body and instantly fades back into it. He quickly increases his brain activity into Beta as he stands up. Someone was knocking on his door which is what was causing his physical to alert him. 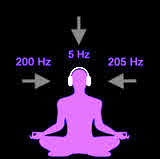 This is a brief illustration of how control over brainwaves is vital for those who are in the Metaphysical arts. Posted in Meditation, Science and Metaphysics by Louis Ruiz with no comments yet. Science and spiritually seem to meet when we explore The Holographic Theory of The Universe. We seem to be relearning knowledge that was known by the ancients as our science progresses to understand our reality and our place in it. To understand what is meant by this statement, here is some background to clarify the points. A hologram is created when a laser is passed through a beam splitter. One beam hits an object (an apple for example) and the other beam hits a photographic plate. Now all the information on the apple has been inputted to the photographic plate. All you see on the plate is a bunch of concentric circles. Like throwing rocks into a pond. You get a lot of circles flowing outward. The information is encoded on the plate. The only way to decode the information is to pass a laser beam through the photographic plate. On the other side of the photographic plate will appear the whole apple in full 3D. All the information contained in the photographic plate is nonlocal. This means it is contained in every part of the plate. For example, you can cut the plate in half and pass a laser beam through any of the pieces. On the other side, the 3D apple will magically appear. You can cut the photographic plate into a thousand pieces and the results will be the same. The apple will magically appear again. The information is everywhere and nowhere, it is nonlocal. The only thing that can decode the information is a laser beam. A laser beam is also called coherent light. This means that all the photons are traveling in the same direction. Focused light. Our Universe is composed of waves of vibrational energy. These waves are like the waves that are created on the photographic plate in the explanation above. Our Universe is a 3D reality we create by decoding bits and pieces of it through our senses. For example, our eyes only pick up a narrow band of frequencies we call the visible light range. How can we see the whole universe. Just like a small piece of the photographic plate with a laser to decode the whole information, what can we use to decode The Holographic Universe? Since time immemorial, mystics from every culture have been describing states of enlightenment and methods for reaching it. Whether they call this state Samadhi, Nirvana or any other name. They all describe the same state and the methods to reach them are similar. “Bring your mind to one pointedness.” “Concentrate on one thing to the exclusion of all others.” “When you reach enlightenment: The observer and the observed become one and in that moment. You know everything and know nothing. You are every where and no where.” These descriptions of enlightenment make sense when you realize that your mind has light like properties. Your mind is like the laser and when you reach a state of coherent thought or focused attention, you decode the universe. The piece of the universe that is used to decode the whole is whatever is the thought or object that is being focused on. This means that focused attention is the method to decode the secrets of the universe and Science is only now catching up to what the Ancients already knew. Meditation is one sure fire way to reach enlightenment. The road to enlightenment comes with many benefits. As your ability to focus your consciousness increases, so will these benefits. The ancients described many of these benefits as Powers. These powers are wide and vary. Some developed powers include super healing, out of body experiences, mind reading, flying and mind over matter. Learning to have a laser like focus will also help us on our day to day activities. The Holographic Theory of the Universe helps explain this ancient knowledge in modern terms. To become enlightened is the goal.